High torque brushless AC servo motor is 3 kW (4 hp) power rating, 2000 rpm, 15 N.m rated torque, peak torque of 30 N.m, equipped with a 2,500 PPR incremental encoder. It is available in a 150mm square flange size, with a brake option. 2 hp (1.5 kW) brushless servo motor with low rated speed of 1500 rpm, max speed up to 1800rpm, rated holding torque of 10 Nm, maximum output torque up to 25 Nm. Single or three phase 220V AC input, 2,500 PPR incremental encoder or absolute encoder attached, manufacturer direct sale. 2.7 kW brushless design servo motor is 380V AC supply voltage, 1500 rpm low speed, 17 Nm rated torque, maximum output torque of 34 Nm, equipped with a 2,500 PPR incremental encoder. It is available in a 180mm square flange size, with a brake option. Brand new 3.6 kW brushless AC integrated servo motor is 150mm square flange size, 2000 rpm, 18 Nm rated torque, peak torque is 36 Nm, equipped with a 2,500 PPR incremental encoder. Low cost servo motor and manufacturer direct sale. AC servo motor drive, 220V single phase or three phase input, 380V three phase input, is a great fit for applications requiring position, speed, and torque control methods. All the power rating range from 50w to 8.6kw of our ATO brushless AC servo motors will work perfectly with this type of servo drive. 3 kW (4 hp) power rating brushless AC servo motor, precision speed control, with a rated speed of 2500 rpm, max speed up to 5500 rpm. Features enhanced durability in harsh industrial environments. To ensure that there is not too big change in control system, it is suggested to choose digital servo system, which can still use the original pulse control method. As the overload capacity of servo motor is strong, 1/3 of original stepper motor rated output torque can be as reference to determine the servo motor rated torque. Since the rated speed of servo motor is much higher than stepper motor, it is better to add a deceleration equipment, so as to make servo motor run at rated speed. To reduce the cost, it is also feasible to choose the motor with smaller power. These are excellent and affordable servo motors. Both 3 kW of them rotate very well. Great fitting for the class projects I needed them for. I am happy with my purchase. Do you have a preferred servo drive for use with this 3 kW 2000 rpm servo motor? Thanks. 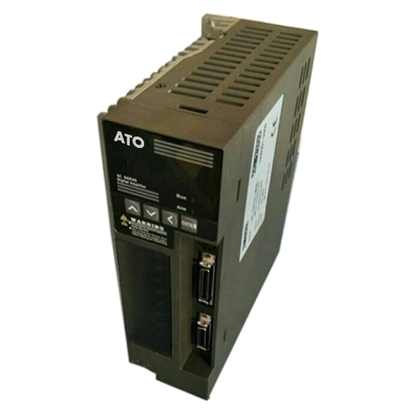 Dear friend, you can refer this one (AC Servo Drive for ATO Servo Motor), see the specs on: https://www.ato.com/ac-servo-drive-for-ato-servo-motor.